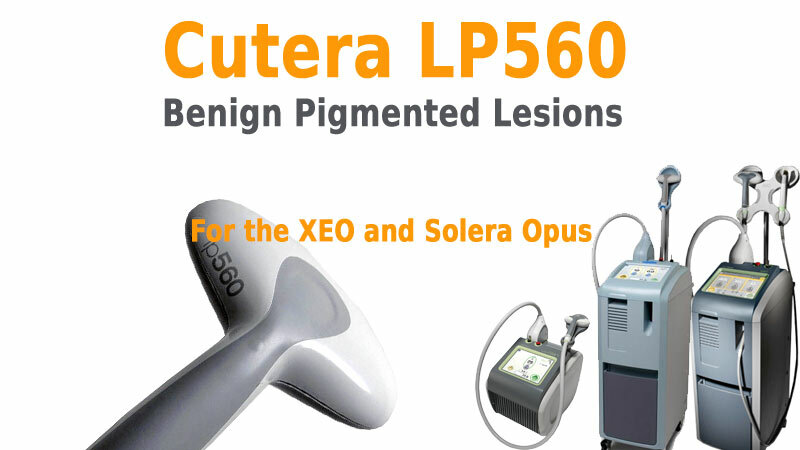 The Cutera LP560 is a pulsed light handpiece that works with both the Solera Opus and the Xeo series of systems. 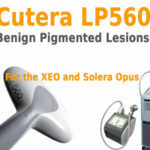 Used most commonly in the removal of benign pigmented lesions (BPLs) and solar lentigines, the LP560 can be used for any treatments that require selective photothermolysis of target chromophores in soft tissue. 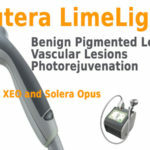 Emitting visible pulsed light at 560-1200nm through a 10-30mm clear window, no aiming beam is necessary; however, it is important that the entire window maintain contact with a patient’s skin during treatment. While the LP560 is one of the most effective tools in BPL removals, it is not recommended for use on patients with Fitzpatrick Skintype VI or those with significant exposure to sun or artificial light (tanning) within the previous four weeks. Instead, the handpiece is intended for patients with Fitzpatrick skintypes I – IV with cautionary use on skintypes IV and V. Correct fluence should be determined by the table below, but variations will exist (i.e. lower fluences for darker target areas and bony areas). Treatment should be performed on clean, shaven skin that is free of all makeup and moisturizers. Skin should also be evaluated to ensure that signs of skin cancer are not present and the LP560 cannot be use on tattooed areas. While no anesthesia is necessary, topical anesthesia can be used at practitioner discretion as long as it is completely removed prior to treatment. During treatment, laser safety eyewear must be worn as the light can cause ocular damage and light from the handpiece must always be pointed away from the eye, never entering the orbital rim. 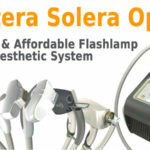 Overtreatment potential is highest in patients with darker skin or skin that has been exposed to long-term tanning, but the desired response for all patients will be some darkening in the treatment areas with possible mild erythema. While spots will darken and crust in a few days and last up to three weeks, the localized erythema typically resolves itself in 24 to 48 hours. 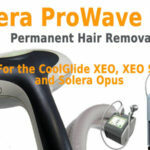 Additionally, patients should be warned that hair removal in treatment areas may occur despite the fact that the LP560 is not intended for that purpose. 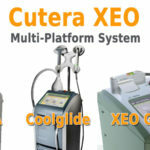 Maintenance on the Cutera LP560 handpiece is simple and keeping up with a general cleaning regimen will extend the life of the device. Before and during treatment, the handpiece should be inspected for damage and it should be disinfected regularly using germicidal disposable wipes. Calibration can be checked periodically but should be performed every twelve months by a certified engineer or technician.